You are invited to attend any and all services and classes. If you see something that catches your interest, please join us! We worship at Faith Presbyterian, our space sharing partner. See the bottom of the page for a map and directions. Their campus is laid out around a courtyard. To find the sanctuary, look for the entrance with two sets of blue-framed glass double doors. 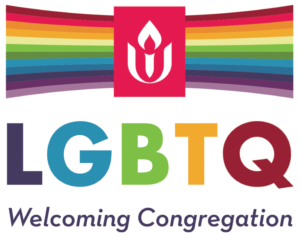 Once inside the vestibule, look for the membership table, where you can tell us more about yourself and learn more about Wildflower and Unitarian Universalism. Don’t forget to pick up a hymnal and Order of Service on your way in! Our services usually run about an hour, usually with a 15-25 minute sermon or a series of homilies. Sermons and homilies can be responsive to current events, ethical, historical, social justice-themed, all of the above, and more. We light a chalice, the symbol of our faith, at the beginning of worship, and extinguish it at the close. We sing hymns and often have choral music and/or guest musicians. We often applaud during church. We have a time for all ages, a time for prayer and meditation, and we sometimes explore varied world religious traditions. Children stay with their parents for the first 15 minutes of the worship service. After the “time for all ages” and the congregation “sings the children out,” teachers lead them to their classes. The children’s program ends at about 12:45 pm, usually 15 minutes after the Worship Service ends. For young children, childcare begins at 9:30 am and continues until 1 pm. Children attending childcare do not have to begin in the service. To promote child safety, two adults are present in childcare and all classes. In accordance with our Safe Church policy, all RE teachers and care providers undergo background checks. After worship, we gather for coffee and snacks in the Wildflower Community Room in the building to the left of the sanctuary (follow the crowd), where you can also retrieve your children. Fellowship Hour is a great time to meet Wildflowers and fellow visitors and talk about anything and everything! If you have accessibility needs, there is ramp access to all entrances at the Faith campus. If you’d like to have more info ahead of time, please email facilities@wildflowerchurch.org. You can also ask ushers for information and assistance on-site. ASL interpretation are available at all Sunday services. Contact worship@wildflowerchurch.com for more information.